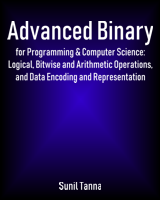 This book explains how the binary number system works and how it is used by digital computers to represent information including positive and negative integers, characters and real numbers. It also explains logical and bitwise operations that computers use to manipulate information and perform arithmetic. Finally, we also briefly look at how computers store this information in memory and secondary storage, and how it can be transmitted between computers. What are number bases (also known as radixes). What is binary (base 2). What is octal (base 8) and hexadecimal (base 16). How to convert binary numbers to denary (base 10). How to convert denary numbers to binary. How binary digits (bits) are grouped into words and bytes. The definition of a byte. The definition of a word. The meaning of Least and Most Significant Bits. LSB 0 and MSB 0 conventions for numbering bits. The definition of a nybble. The correspondence between a nybble and a hexadecimal digit. Nybbles can be used to store denary/decimal digits in BCD representations. The effect of word alignment on packing and padding of data structures. Why there may be a need to repack data structures. Packing data structures and the trade-off they involve. The meaning of Least and Most Significant Byte. Fundamentals of Boolean algebra, logic gates and truth tables. Combining logic gates to create other logical operators. NAND and NOR are functionally complete. How to implement NOT using NAND logic. How to implement AND using NAND logic. How to implement OR using NAND logic. Two ways to implement XOR using NAND logic. How to implement NOR using NAND logic. The difference between logical and bitwise operations. How to use bitwise operations to ensure particular bits are set. How to use bitwise operations to invert (flip) particular bits. How to use bitwise operations to ensure particular bits are clear. How to use bitwise operations to test particular bits. Column addition of binary integers. How to implement binary addition using logic gates. What is and how to create a half adder. What is and how to create a full adder. How to connect multiple adders to create a ripple-carry adder. Performance limitations of ripple-carry adders. Column subtraction of binary integers. How to implement binary subtraction using logic gates. What is and how to create a half subtractor. What is and how to create a full subtractor from two half subtractors. Multiple subtractors can be connected to subtract multi-bit numbers. What is a left bit shift operation. How left shifts are usually equivalent to multiplying by two. How left shifts can result in numeric overflows. How to test for numeric overflows in left shifts. How to set the new least significant bit in left shifts. What is a right bit shift operation. How right shifts are usually equivalent to dividing by two and rounding down. How to test for rounding in right shifts. How to set the new most significant bit in right shifts. Left and right circular bit shifts. How to multiply by powers of 2. Column multiplication of denary and binary numbers. How to divide by powers of 2. Comparing denary and binary long division. Why binary long division is easier than denary long division. How to create an algorithm for binary long division. How computers represent characters in memory. Why different systems interpret ASCII differently. Issues with transferring ASCII text files between different types of computer systems. The various Unicode character-encoding systems including UCS-2, UTF-32, UTF-16 and UTF-8. How UTF-16 encodes characters into 2 or 4 bytes. How UTF-8 encodes characters into 1, 2, 3 or 4 bytes. How strings of characters are represented in computer memory. How terminated strings including byte-terminated, null-terminated, and bit-terminated strings work. Advantages and disadvantages of terminated strings versus length-prefixed strings. Why other types of string representations are sometimes used. How text mode displays store information about screen contents. How bitmap displays store information about screen contents. The purpose of parity checking and parity bits. The meaning of even parity. The meaning of odd parity. The advantages, disadvantages and limitations of parity checking. Parity's use in RAID storage devices. The meaning of a stick parity bit. The meaning of a mark parity bit. The meaning of a space parity bit. How computers represented signed numbers. What is offset binary representation. What is signed magnitude representation. How real numbers can be represented using fixed point representation. How real numbers can be represented using floating point representation. What is the rational data type. How real numbers can be represented using logarithmic number systems. Why use denary representations of real numbers. What are character-based encodings of denary. What is Binary-Coded Decimal (BCD). What are the NBCD (8421), 4221 and 7421 variants of BCD. What is Densely Packed Decimal (DPD). Which numbers can be exactly represented in binary fixed-point and floating-point representations. Which numbers can be exactly represented in decimal fixed-point and floating-point representations. How inexact can binary fixed-point and floating-point representations be. What issues does inexact representation cause. What is decimal representation (including decimal floating-point representation). What are composite data-types (structs) and how are they stored in memory. What are arrays and how are they stored in memory. The differences singly linked-lists and doubled-linked lists. Possibilities for more complex data-structures. Types of computer memory used in early computers. What is magnetic-core memory and core rope memory. What are the different types of RAM memory. What are the different types of ROM memory. The difference between sequential and random-access secondary storage devices. What is punched tape storage. What is magnetic tape storage. What is magnetic disk storage. How data is organized into tracks, sectors and clusters on magnetic disks. What is the difference between hard disks and floppy disks. What is optical disk storage. What are the different types of optical disks. What are solid state drives and flash memory secondary storage. How memory and storage is measured. What is serial data communication. What are the advantages and disadvantages of using serial communications. What is the difference between Least Significant Bit first and Most Significant Bit first serial communication protocols. What is parallel data communication. What are the advantages and disadvantages of using parallel communications. How data transfer rates are measured. What is the difference between bit/second and Baud/second. 3D "cover" and "box" images are for decorative purposes only. They do not represent actual products which are generally delivered as an electronic downloads. Most box/cover images on this website were created using Cover Factory.